3. Select the images files you want to add as sprite in your screensaver. 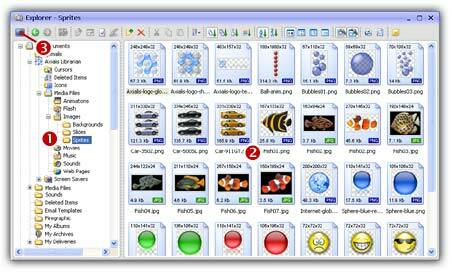 It includes standard images, icons, cursors and animated GIFs. If you want to add a background music, select a music or sound file (MP3, WAV, MID...). 5. A dialog box opens. Select Sprite Based Screen Saver option in the list. Click Next. 8. For example, if you want to create a bouncing sprite: Choose Straight Line and Bouncing on the edges of the screen options. Set the direction and speed of the sprite. We can do this by specifying 2 values: The Horizontal and Vertical speeds. Specify any data from -500 to +500. You can also randomize the speed (see options on right). When done, click OK. To learn more about sprite screensavers, we recommend you to follow this tutorial. 9. We can take a look at the result full screen. Press F11 or click the Full Screen button in the toolbar. The screensaver is executed full screen. Press a key or move the mouse to end the full screen test. 10. Save your project by choosing File/Save or by pressing Ctrl+S. 11. Now you can compile your screensaver or compile and create an installation package.